Happy Friday! I’ve been out and about sourcing for a few client projects this week and I’m hoping to catch up on some paperwork and organizing today. Right now, my home office looks disastrous. 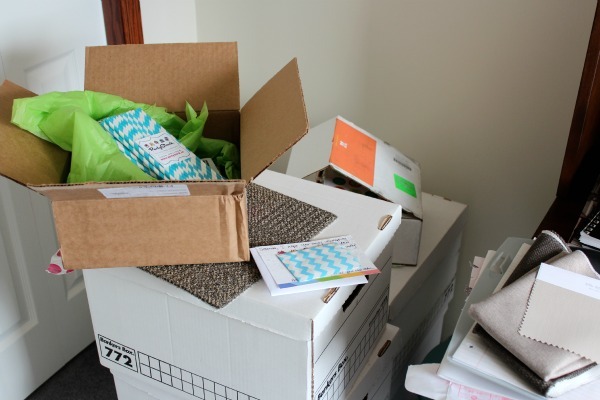 It’s filled with carpet and tile samples, boxes of supplies delivered for my son’s graduation party, photographs, furniture catalogues, fabric and window treatment samples for our basement… It’s really out of control. It goes against everything I suggest to clients when I’m working on organizing projects: Have a place for everything and put everything in it’s place! My home office clutter basically started when I decided to donate the storage cabinet in my office before I found a replacement. I really couldn’t stand looking at the dated piece any longer! My husband and son were taking a load to our local thrift shop and I thought it was a great opportunity to get the ball rolling on finishing up my office. In hindsight, I already had too many juggling balls in the air, and adding one more led to the office pile up. When there isn’t anywhere to put stuff, there’s always going to be clutter and chaos. My temporary solution to hold everything has been a few banker’s boxes. Not so pretty, but they keep everything contained in the meantime. My plan (when I have time to plan) is to determine exactly what I need to store and then source a cabinet with those specifications in mind. My inspiration is something like the storage cabinets in these beautiful and organized home offices/studios (so envious!). Now that I’ve found the inspiration, I just need to plan out what will work best to deal with my home office clutter. As a designer, there are always a lot of moving parts and items coming in and out of my office. I need a sound plan. I’m hoping the sourcing and installation will be shortly after my son’s graduation party (priorities, you know!). I’ll keep you updated. Having a few clutter problems of your own? What are the hot spots in your home? Take a look at my Beautiful and Clever Organization board on Pinterest for some ideas. Oh, I know the feeling so well. Give away something before I have a replacement and then usually my creative mind comes up with 1,000 different projects in the meantime so I forget all about what I actually need:( So much easier designing for clients, huh? Totally! I have too many projects going on right now to properly address this one. With around 50 people coming to our house in 2 weeks for the grad party, I really can’t focus on my office right now! Oh my goodness, Shauna your post came at a great time because I’m cleaning out the clutter in my office and this is exactly what I had in mind. I am into purchasing those shelves from Ikea and having that extra counter space on top. I have two tall black shelves that lean against the wall in which I’m tired of and would like to reorganize everything. I need inspiration in my workplace, so it’s time to switch it up. Focus on the grad party and when you’re ready, dig into your office, it will be fun. Have a great weekend! Our home office is always a wreck! My husband and kids are the problem. If I could just keep them out of there, lol. I think my husband just needs to go to his office in the city and work. Solves that problem! I love your inspiration Shauna and must check out your Pinterest board for more!! Have a great weekend!! my home office is officially a disaster! keep us updated – this might be the inspiration i need to finally tackle it! I hear you sister! I finally organized closet for all of my client work… but it always seems to seep out of the closet onto other surfaces! You will find the right method very soon! It’s the life of a designer. Too many samples coming in and out and never enough space as you know! Yes, you’ve about summed me up!! We have prom behind us now, and I am just starting to feel my feet underneath me again, but it’ll still be a slippery slope until walk-up, next week. It’s like the lens cap has been taken off, and I can’t believe all the half started projects still waiting for my attention to finish them. Honestly, the question is where to start, which one should I tackle first to finish? I did check one thing off my list yesterday, and that was finally getting my pots planted up for outside. I had one day a while back to do that, and somehow that day got overshadowed by other demands. Hhhhh. I’m really hoping for a slower pace over the summer. Good luck with your son’s grad celebrations, Shauna, and with your office overhaul!